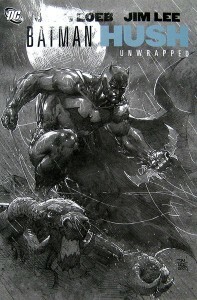 A deluxe reissue of the 2002 collaboration between Jeph Loeb and Jim Lee, emphasising the artistic side of the partnership. Storywise, itâ€™s very much in the same mould as Loebâ€™s earlier volumes with Tim Sale: The Long Halloween and Dark Victory. The formula is that of a mystery, conveniently bringing Batman into conflict with most of his rogues gallery. In this case, the character pulling the strings calls himself Hush. A new foeâ€¦ or is it? Even though Hush is nearly a decade old, I wonâ€™t spoil the reveal, as without it, the story would be robbed of its raison dâ€™Ãªtre. Why bring out this version? Someone discovered Jim Leeâ€™s original pencil art for the series, and had the idea of putting out a collection stripped of both inks and colouring, to show off Leeâ€™s tight pencil art. So that it can still be read as a comic, they retain Richard Starkingsâ€™ lettering, but to be honest, the colour text boxes and special effects look garish on top of line art. If you want to read Hush, Iâ€™d recommend one of the more traditional editions. This one is strictly for the Jim Lee fans, or wannabe artists who can learn from looking at pencil originals, and compare against the finished pages. An oddity rather than an essential purchase.